"I feel alive again." Cohen Media Group has released an official US trailer for the film Gauguin: Voyage to Tahiti, originally known as just Gauguin in its released in Europe last year. The film is finally hitting limited US theaters this summer. 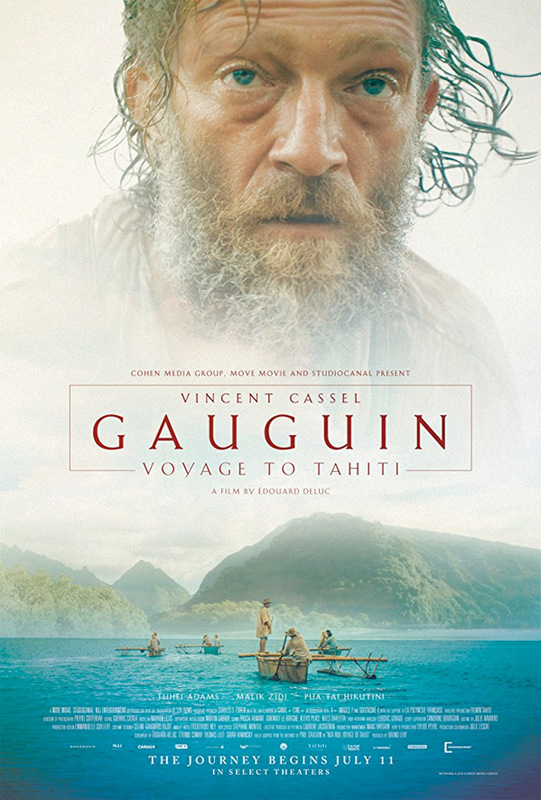 Gauguin: Voyage to Tahiti stars Vincent Cassel as famous French artist Paul Gauguin, a painter who decided to leave behind his wife and child and civilized life to travel out to Tahiti in 1891. The film is about his decision to go to Tahiti and his romance and connection with a young Tahitian girl named Tehura, played by Tuheï Adams. The cast includes Malik Zidi, Pua-Taï Hikutini, Pernille Bergendorff, Marc Barbé, Paul Jeanson, Cédric Eeckhout, and Samuel Jouy. This looks quite good, with a compelling performance by Cassel as the inspired painter. I would really like to see this. French artist Paul Gauguin (1848-1903) was an innovator of modern art, known for experimenting with bold color and distorted proportions, along with his contemporaries Vincent van Gogh and Paul Cézanne. By 1891, Gauguin was already well-known in artistic circles, but had grown tired of the civilized world and its political and moral conventions. Leaving his wife and children behind, he ventures alone to Tahiti, consumed with a yearning for new inspiration. Pushing deep into the Tahitian jungle, Gauguin meets Tehura, his muse, who will consume his mind and inspire his most iconic works of art. Gauguin: Voyage to Tahiti is directed by French filmmaker Edouard Deluc, of only the film Mariage à Mendoza previously and a few short films. The screenplay is written by Edouard Deluc & Etienne Comar & Thomas Lilti & Sarah Kaminsky; based on the book "Noa Noa, Voyage de Tahiti" written by Paul Gauguin. Cohen Media Group will release Gauguin: Voyage to Tahiti in select theaters starting July 11th this summer. Who's interested?